How might the late George Webster, a Michigan State College Football Hall of Fame linebacker/safety on the 1965 and 1966 national championship teams, have viewed Jon Reschke re-joining the Spartans following a racially charged text? Michigan State’s pioneering Underground Railroad teams established a history for recruiting the segregated South and leading the integration of college football. In the 1960s, when southern conferences remained all-white and integrated schools limited their rosters to a half-dozen or so black players, Michigan State lined up 20 against Notre Dame’s one (Alan Page) in the 1966 Game of the Century. College Football Hall of Fame running back Clinton Jones, who shared the captain's honors with Webster in 1966, described Michigan State's campus as an "oasis" from the racism African-Americans had experienced elsewhere in life. Those Duffy Daugherty-coached Spartans featured a plethora of leaders, starting with Webster and Jones as the first pair of black team captains elected by a player vote without a white teammate sharing the roles. Another team leader was the South’s first black quarterback to win a national title, Jimmy Raye of Fayetteville, N.C. He joined Michigan State’s Hall of Fame in a Thursday night ceremony and will be honored with the Class of 2018 during Saturday’s game against Central Michigan at Spartan Stadium. 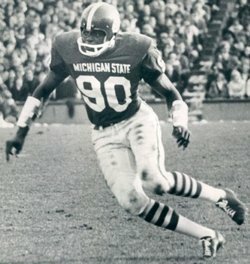 But on this color-blind team of leaders, Jones acknowledged Webster was the Spartans’ towering presence -- both psychologically and physically, even though the late defensive end Bubba Smith was a rare 6-foot-7, 285-pound giant for his era. Reschke is a sixth-year senior linebacker that Michigan State head coach Mark Dantonio re-instated to the roster this season. He had left the team in February 2017 in a mutual agreement with Dantonio. The decision followed a text Reschke sent that involved a male, an ex-girlfriend and the n-word. Reschke wasn’t expected to re-join the Spartans until Dantonio announced last summer that a team vote, with weighted input from the black players, including African-American team tri-captain Khari Willis, approved his return. A month into the season Reschke has been welcomed back without ramifications. Jones, 73, cited a non-racial incident when Webster’s leadership solved what could have been a critical NCAA team issue. Following the 1965 national championship, Smith showed up driving a new Oldsmobile. A national media report claimed a booster had paid for it. Jones recalled that Daugherty, on the advice of team chaplain Don Ward, called a meeting in his office that included Ward, Smith, Webster and Jones. Ward was respected, especially among the black players, for his participation in the 1964 Freedom Summer that registered blacker voters in Mississippi. Daugherty later learned the then-Houston Oilers had paid for the car as part of the American Football League-National Football League bidding war for players prior to the 1967 merger. Smith returned the Oldsmobile, and his father, a high school teacher and coach in Beaumont, Tx., financed a Buick. The car was soon dubbed and widely known on campus as the Bubbamobile. By then the Spartans had moved on to their second straight Big Ten title and were unbeaten. The epic game ended in a 10-10 tie, and the National Football Foundation voted Michigan State and Notre Dame national co-champions for their tie on the field and identical 9-0-1 records. Daugherty’s Underground Railroad teams traversed historic ground to allow Webster, an athlete recruited out of segregated South to rise through sports’ meritocracy to an uncontested leader. The history, in addition to Webster and Jones as captains and Raye commanding the huddle, includes Michigan State as the first school with four black players from the same class named to the College Football Hall of Fame: Webster (1987), Anderson, S.C.; Smith (1988), Beaumont, Tx. ; wide receiver Gene Washington (2011), La Porte, Tx. ; and Jones (2015), Cleveland, Oh. What also is special about a Hall of Fame weekend on a campus is it brings together the past, the present and looks ahead to the future. George would say Spartans are obligated to embrace now and into the future a Michigan State legacy that led the integration of college football.